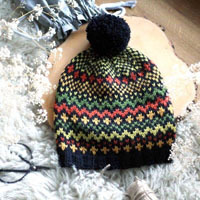 Go to original pattern for design DROPS Children 23-13. Knitted gloves with crochet flower in DROPS BabyMerino and DROPS Glitter. Size children 3 to 12 years. DROPS DOUBLE POINTED NEEDLES size 2.5 mm / US 1.5 - or size needed to get 26 sts x 34 rows in stockinette st = 10 x 10 cm / 4'' x 4''. DROPS CROCHET HOOK size 3 mm / C - for flower. 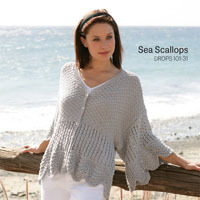 You can get the yarn to make this pattern from	15.10$. Read more. Cast on 40-44-48 sts on double pointed needles size 2.5 mm / US 1.5 with purple. Work rib = K 2/P 2 for 6-7-8 cm /2½"-2 3/4"-3 1/8". Continue in stockinette st – AT THE SAME TIME on 1st round dec 2 sts evenly = 38-42-46 sts. Insert a marker in 2nd st on round (= thumb st). REMEMBER THE GAUGE! When 1 cm / 3/8'' in stockinette st has been worked, beg inc for thumb by making 1 YO on each side of thumb st, on next round work the YOs twisted. Repeat inc every 3rd round 2-3-4 more times (inc on each side of all thumb sts, i.e. inc 2 sts more between every inc) = 7-9-11 thumb sts. 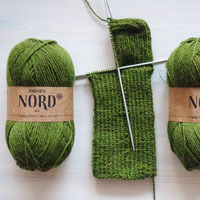 When piece measures a total of 9-11-13 cm / 3½"-4½"-5", slip the 7-9-11 thumb sts + 1 st on each side on a stitch holder (= 9-11-13 sts on stitch holder). Then cast on 3 new sts behind sts on stitch holder = 38-42-46 sts. Continue in stockinette st in the round until piece measures 11-14-17 cm / 4½"-5½"-6 3/4". Work next round as follows: Work the first 14-16-17 sts and slip them on a stitch holder = inside hand, keep the next 10-10-12 sts on needle for little finger, and slip the last 14-16-17 sts on another stitch holder = on top of hand. Then work the fingers. 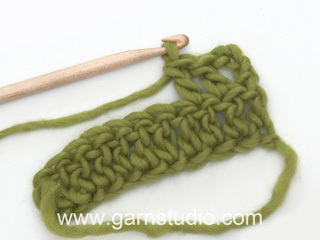 = 10-10-12 sts, in addition cast on 2 new sts towards sts on stitch holders = 12-12-14 sts. Work in stockinette st in the round for 3½-4-4½ cm / 1 1/4"-1½"-1 3/4". On next round, K2 tog around, cut the thread, pull it through the remaining sts and tighten. Slip 4-4-5 sts from each of stitch holders back on needle. In addition pick up 3 sts towards little finger and cast on 2 new sts towards sts on stitch holders = 13-13-15 sts. Work in stockinette st in the round for 4½-5-6 cm / 1 3/4"-2"-2½". On next round, K2 tog around, cut the thread, pull it through the remaining sts and tighten. Slip 4-5-5 sts from each of stitch holders back on needle. 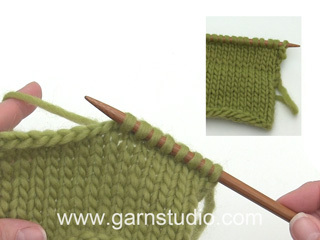 Knit in addition up 3 sts towards ring finger and cast on 2 new sts towards sts on stitch holders = 13-15-15 sts. Work in stockinette st in the round for 5-6-7 cm / 2''-2½''-2 3/4''. On next round, K2 tog around, cut the thread, pull it through the remaining sts and tighten. Slip the remaining 6-7-7 sts from each of the stitch holders back on needles, knit in addition up 2 sts towards the middle finger = 14-16-16 sts. Work in stockinette st in the round for 4½-5-6 cm / 1 3/4"-2"-2½". On next round, K2 tog around, cut the thread, pull it through the remaining sts and tighten. 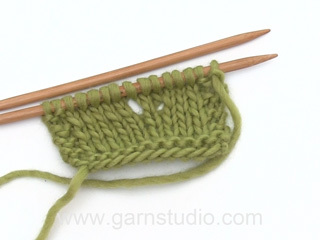 Slip the 9-11-13 sts from stitch holder for thumb back on needles, knit in addition up 5 sts in the edge behind the thumb sts = 14-16-18 sts. Work in stockinette st in the round for 3-4-5 cm / 1''-1½''-2''. On next round, K2 tog around, cut the thread, pull it through the remaining sts and tighten. Work as right glove but reversed, i.e. inc for thumb gusset are done on each side of next to last st on the round. 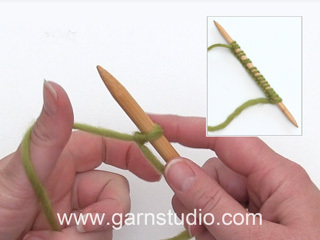 When working the little finger, work as follows: Work the first 14-16-17 sts and slip them on a stitch holder = on top of hand, keep the next 10-10-12 sts on needle for little finger, and slip the last 14-16-17 sts on another stitch holder = inside hand. Work on hook size 3 mm / C with Baby Merino + Glitter. Ch 4 with light old pink + silver and form a ring with 1 sl st in 1st ch. ROUND 1: ch 1, 6 sc in ch-ring, finish with 1 sl st in first sc. ROUND 2: Ch 4 (= 1 sc + 3 ch), * 1 sc in next sc, 3 ch *, repeat from *-* a total of 5 times, finish with 1 sl st in 1st ch from beg of round = 6 ch spaces. ROUND 3: ch 1, then work as follows in every ch space: 1 sc, ch 1, 3 dc, 1 ch and 1 sc, finish round with 1 sl st in ch from beg of round = 6 leaves, cut the thread in Baby Merino. ROUND 4 (switch to old pink + silver): Ch 7, * 1 sc between the next 2 leaves, ch 6 *, repeat from *-* a total of 5 times, finish round with 1 sl st in 1st ch from beg of round = 6 ch spaces. ROUND 5: ch 1, then work as follows in every ch space: 1 sc, 1 hdc, 5 dc, 1 hdc and 1 sc, finish round with 1 sl st in ch from beg of round = 6 leaves, cut the thread and fasten the threads. Work a total of 2 flowers like this. Fasten 1 flower on top of each glove.